Shihan Paul Godshaw, Chief Instructor and Sensei of the Mission Viejo Branch of the Japan Karate-Do Federation has one of the most impressive backgrounds of Martial Arts Experience in the United States, as well as around the world. Mr. Paul Godshaw started training in 1965 with Mr. Dan Ivan and Fumio Demura. Under their tutelage, he had earned a Yon-Dan (4th Dan) Black Belt. And, by strict examination of the Masters of the International Martial Arts Federation, Mr. Godshaw has also been awarded a Hachidan (8th Dan Black Belt in Karate-Do). Mr. Godshaw is also very experienced in Judo, Aikido, and Kubodo (weapons). He began teaching Karate in 1973. Since that time he has developed the Mission Viejo Branch of the Japan Karate-Do Federation into one of the strongest in the country with an excellent reputation among Karate Dojo's. 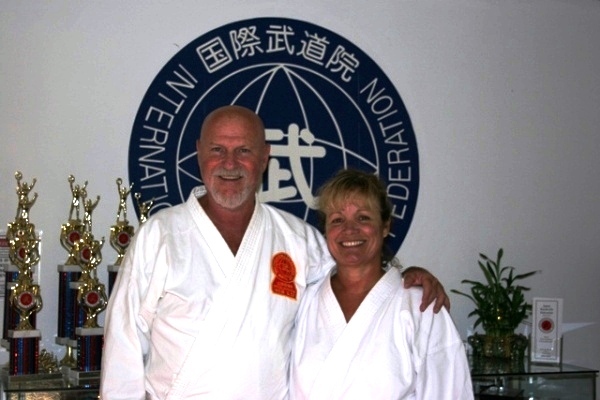 Mr. Godshaw was a respected competitor and maintains the very highest standard for officiating and teaching the traditional Shotokan Martial Arts. These standards and respect in the Martial Arts world have earned him the title of National Chief Referee of the Amateur Athletics Union and the United States Branch Director of the International Martial Arts Federation. Karate is a well respected discipline for the entire Godshaw family. Being Black Belt Karateka, they all enjoy sharing their expertise as Martial Arts Instructors. I began my training in karate in 1983 and began teaching in 1986. I’m responsible for the children’s program at the hombu dojo and I thoroughly enjoy it. We have developed many karate champions throughout the years. My main goal is that the children meet individual success. We work on learning kihon, kata, kumite, self control and discipline. I strive for the students to carry themselves as kind, well mannered and respectful children. I want them to give one hundred percent to any activities that they are involved in, feel great about their efforts and enjoy their rewards. I stress to the students that winning a trophy or a medal is a great experience, but an experience that is for them. Not for their parents and certainly not for me. I am very supportive and enjoy cheering them on. I assure them that I would never be disappointed if they didn’t win a medal or trophy - They are number one just for trying. By working hard, preparing mentally and physically and giving it their best shot they meet success. Giving their best effort and having fun is what makes a true champion. My hope is that they can rise to any occasion and that they feel comfortable in any situation. They should just feel great about themselves. I take great pride in working with the children and it is extremely rewarding watching them develop to meet their potential.